The prices include all taxes, services and amenities featured in our website, such as pool, bar, restaurant, pool and beach towels, parasols and chairs for the beach, laundry service at low cost, maid service, extra afternoon service with extra charge, homemade buffet breakfast. Please contact us and it will be pleasure for us to help you manage your trip to Antiparos from any airport or port of Greece. 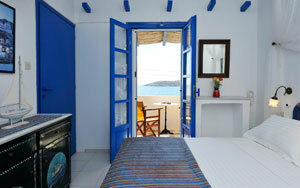 We also offer free of charge your transportation from/to the port of Antiparos. We would ask you your arrival and departure to be on Saturday or Sunday, especially on July and August. To confirm your reservation, a valid credit card will be required. To confirm your reservation, a deposit of 30% of the total cost of your stay must be made within 7 days of acceptance of your booking. A further 20% is due 21 days before your arrival. The remaining 50% is due on the day after your arrival. To confirm your reservation, a deposit of 50% of the total cost of your stay must be made within 7 days of acceptance of your booking. The remaning 50% is due 21 days before your arrival. Cancellation earlier than 30 days before the arrival will result in no charge. 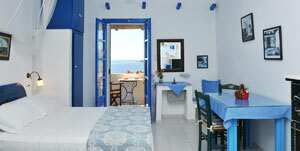 Cancellation 7-30 days before the arrival will result in a charge equal to 50% of the total stay cost. Cancellation less than 7 days before the arrival or failing to show will result in a charge equal to 100% of the total stay cost. Early check-out: 100% charge for the remaining days. 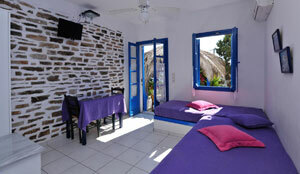 Cancellation or failing to show will result in a charge of 100% of the total stay cost. Bank account deposit: no surcharge. Mastercard/Visa credit cards: 2% surcharge. Complimentary baby cot and bed guard rail. Breakfast, listed amenities and taxes are included in the room price. Lunch and dinner meals are not included in the room price. Free transportation from and to the port of Antiparos. The hotel is not suitable for pets.